Easter is a holiday oddly bereft of pop-cultural artifacts. An outwardly religious holiday, the celebration suffers from not having a rich secular mythology built up around it, unlike Christmas, which allows for countless movies and specials about some unseen facet of Santa Claus’ North Pole lair. Consequently, that leaves the holiday without the sorts of flotsam and jetsam that pop up on local TV stations during the Christmas season, outside of the usual slate of Biblical epics. It’s not for lack of trying, however, and one of the most successful attempts—in that it still airs annually—is this look at what the Peanuts kids do around Easter, which features none of the religious moments that marked the strip’s more famous Christmas special. Like many of the specials based on Charles Schulz’s comic strip, Easter Beagle is fairly plotless, instead choosing to show how Charlie Brown and friends engage in traditions like painting Easter eggs or having an egg hunt. The special is loosely held together by Linus’ belief in “the Easter beagle” and Snoopy’s attempts to fill that role. It’s a pale imitation of the Great Pumpkin and a fitting example of how Easter seems to get tired spins on leftover ideas from other holidays. This mixture of animation and live-action from the director of Alvin And The Chipmunks and Garfield: A Tail Of Two Kitties is Hollywood’s highest-profile attempt in a while to cash in on Easter. It may not think about trying again for quite some time. The Rabbit Without A Cause setup involves the Easter Bunny’s son, E.B. (voiced by Russell Brand), who doesn’t want to follow in his father’s paw prints. Instead, he flees the family home on Easter Island and runs off to Hollywood to become a musician. In L.A., he meets James Marsden, who, funny thing, has always wanted to be the Easter Bunny, but didn’t know where to send his CV. The movie, which features knowing cameo appearances by everyone from David Hasselhoff to the Blind Boys Of Alabama, did well at the box office, despite horrendous reviews, complaints about its product placement, and even accusations of racism, thanks to the villain, a scheming chick named Carlos—voiced, with a Mexican accent, by Hank Azaria—who is prepared to kill off the Bunny family, if that’s what it takes for a chick to rise to the top job. It was a Christmas-themed horror film, 1984’s Silent Night, Deadly Night, that moved an appalled Leonard Maltin to ask, “What’s next, the Easter Bunny as a child molester?” It would be more than 20 years before somebody took him up on it with 2006’s Easter Bunny! Kill! Kill! This sleazy, no-budget-and-less-talent shocker is about a “mentally challenged” 16-year-old boy (played by Ricardo Gray, whose performance suggests a badly botched attempt to clone Donald Glover) whose favorite holiday is Easter. As his mother explains, he wishes every day could be Easter, because that’s the day his father died. (Wait, what?) After mom decides to leave the kid alone with her new boyfriend, a slimy thug who is first seen robbing a store and killing the clerk while wearing a bunny rabbit mask, the action proceeds with a series of lowlifes—hookers, disgruntled Mexican gardeners, and, yes, a child molester—violating the sanctity of the family home and being knocked off in gory fashion by a figure in the rabbit mask. As far as post-Gremlins comedy/horror creature features go, Critters 2 is, well… it’s one of them. Where Joe Dante’s original Gremlins is a great incidental Christmas movie, Critters 2 works as an incidental Easter movie. The film flirts with the religious sanctity of the Easter season in a scene in which Scott Grimes and his family seek refuge from the pesky Crite aliens inside of a church, as if the critters couldn’t harm them there. But then, in the film’s ghastliest (and best) setpiece, a man dressed in an Easter Bunny costume is set upon by a flock of critters who hop inside the open fly of the suit and begin devouring him from the inside, before chucking him through a church’s stained-glass window. It’s not exactly Dante-level inventiveness, but come on. What do you expect from Critters 2: The Main Course? It’s Easter time at Jellystone Park, and Ranger Smith is worried about a visit from the Supreme Commissioner, who got the job by putting out forest fires with his bare hands. Specifically, he’s worried that Yogi Bear is going to steal all the snacks and generally ruin the festivities. Indeed, Yogi’s initially his usual pestilent self, cheerfully intoning, “When there’s candy in the air, you’ll find—who else?—Yogi Bear!” But when things get serious and he’s threatened with being sold to a Siberian bear circus, Yogi pledges to find the Easter Bunny and bring him to Jellystone. Unfortunately, the bunny’s been kidnapped by Paulie (Charlie Adler), a megalomaniac who plans on replacing real Easter eggs with plastic. It’s up to Yogi to rescue the bunny, who turns out to be a kind of middle man: Rabbits, he points out, can’t make eggs. So along with the rabbit rescue, the Easter egg-making chicken is picked up along the way to delight the Supreme Commissioner’s children. As usual for Hanna-Barbera, this is cheap entertainment for kids, featuring shoddy animation and some truly head-spinning attempts to craft a workable Easter mythology. The comic strip The Family Circus didn’t mind indulging in occasional references to its characters’ mainline Protestantism, and the strip’s Christmas special featured vague references to how the children’s grandfather was watching over them from heaven. As with Peanuts, none of that religious expression survives in the strip’s Easter special, which goes all in on the idea that the older kids need to make sure the Easter Bunny won’t hide eggs where they can’t be found by P.J.—who’s just a “little baby,” sister Dolly sneers. While hiding eggs where they believe P.J. will be able to find them, the older kids come to think they’ve met the real Easter Bunny (complete with Dolly singing a supremely irritating song to tell him just how she feels about his egg-hiding ways), and oldest brother Billy decides to catch him. The plot peters out around the halfway mark, so Dizzy Gillespie is brought in as the Easter Bunny himself, to guide the kids through an Easter wonderland and sing about it. Everybody does go to church in the end, but even there, the rabbit wins out: Billy prays he’ll finish his rounds, while P.J. and Dolly hide an egg in the collection basket, so God will have to look for it. Leave it to the Berenstain Bears and the other residents of Bear Country to remind kids of Easter’s roots as a pagan holiday celebrating the beginning of the spring thaw. In this holiday special, the third of five intended to bring the beloved children’s book characters to the small screen, spring simply refuses to come, and the Bear children, stuck at home by the huge snow drifts, find that their most pressing concern is whether Easter will arrive in a timely fashion, not whether this extreme climate shift is the harbinger of the death of all mammals. Naturally enough, spring refuses to arrive because the Easter Bunny (here known as “Boss Bunny”) refuses to do his rounds. (You’d think this would be the business of the Groundhog Day groundhog, but in Bear Country, the bunny has astounding powers.) Papa Bear takes over for the year, and it goes about as well as you’d expect, though the death of all living things is averted. While South Park’s no stranger to satirizing religion, it’s only taken on the holiest holiday twice. In “The Passion Of The Jew,” Kyle is haunted by the violence of The Passion Of The Christ and questions his own Jewish heritage because of the film’s portrayal of Jews’ role in Jesus’ crucifixion. That storyline is eventually overtaken by Mel-Gibson-is-insane and Cartman-as-Hitler plots, but Easter is front and center in “Fantastic Easter Special.” Determined to get to the bottom of why he has to decorate Easter eggs, Stan uncovers The Hare Club For Men, a secret society that protects “the secret of Easter”: St. Peter was actually Peter Rabbit. Before Stan can be initiated, ninjas attack on behest of the Catholic Church, and the episode becomes a spoof of The Da Vinci Code. In a dark callback to “The Passion Of The Jew,” Kyle is forced to kill Jesus so that Jesus can, in turn, be resurrected and save the day. It’s one of the show’s better episodes, and if the conclusion—in which a rabbit named Snowball is ordained as the Pope—seems, surreal, well, that’s just South Park being itself. We disqualified straightforward Biblical adaptations from this list, simply because those selections would have overwhelmed any others, but surely there’s room for The Simpsons’ first attempt to port its “Treehouse Of Horror” format to another holiday? The yearly Halloween episode aimed for three scary stories, while this one dumps the Simpsons and their friends into four different Biblical stories—about Adam and Eve, Moses in Egypt, King Solomon, and David and Goliath—when a warm Easter Sunday church service causes the family to doze off. Oddly for an Easter episode, there are no New Testament stories depicted (perhaps because the writers realized depicting any Simpsons character as Jesus was just asking for protests), but the episode ends with the family waking to find the Apocalypse has descended, and they’re headed for hell. Happy Easter, everybody! The Easter Bunny origin story had to wait another five years, but Rankin-Bass finally tackled it with this off-putting combination of the hyper-elaborate and the wholly unnecessary. Why “Easter Rabbit” and not “Easter Bunny”? 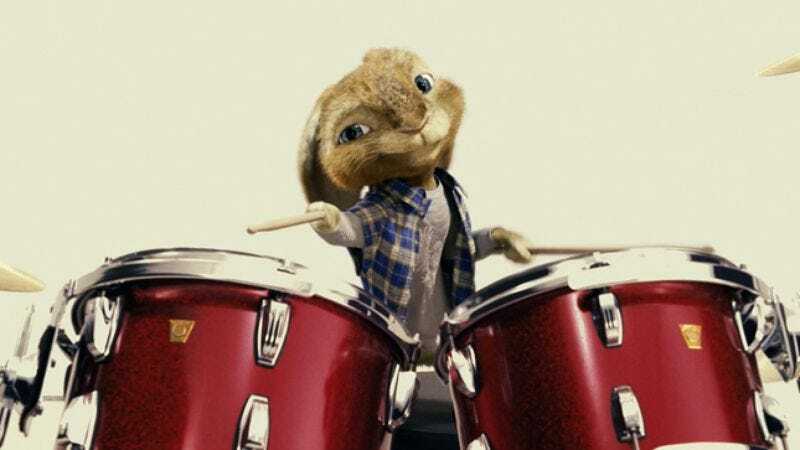 Best guess: The studio already had The Easter Bunny Is Comin’ To Town in the works but wanted something to fill the Easter-special void until that stop-motion production was completed. Given the results of this animated effort, it needn’t have bothered. Although Rabbit features voices already familiar to Rankin-Bass fans, including Burl Ives and Paul Frees, the plot is a bizarre amalgam of premises. When a young girl contracts scarlet fever, the doctor orders her mother to destroy all of her clothes and toys as a precaution against re-infection, but a fairy named Calliope saves a stuffed rabbit (its name: Stuffy) from a fiery demise by bringing it to life and declaring it to be the first Easter Rabbit. (Shades of The Velveteen Rabbit!) For added drama, there’s a battle with an evil ice wizard, and Santa Claus is even brought into the picture, possibly to up the street cred of the holiday without incorporating any religious elements whatsoever. Rankin-Bass took another whack at an Easter Bunny origin story by basically stuffing the holiday into the well-worn framework of its Christmas special, Santa Claus Is Comin’ To Town. Like the earlier program, it begins with Fred Astaire’s living doll-man mail-carrier promising to answer some of the questions in the letters addressed to the Easter Bunny, such as, “What’s with the painted eggs?” and, “Why does everyone get new clothes at Easter?” (We do?) The tale he relates begins in Kidville, a remote Socialist hellscape populated entirely by children where “everybody shared everything and worshipped the Lord in their own way.” The kids adopt a lost baby bunny named Sunny, who grows up to challenge Duchess Lily Longtooth, who runs the neighboring town. (Lily has banned children from her fiefdom and makes everybody eat nothing but beans.) Abetted by such helpers as Chugs—“the famous little engine who could”—the lovable hobo Hallelujah Jones, and Gadzooks the Bear, Sunny is able to overcome such formidable obstacles as Lily pouring melted butter on the railroad tracks. Strangely, the original Here Comes Peter Cottontail got a sequel in a different style, with a different cast, and from a different production company more than 30 years later. The crudely CGI-animated, direct-to-DVD follow-up has Irontail (now apparently British, as he’s voiced by Roger Moore) teaming up with Jackie Frost (Molly Shannon) to steal “the spring of spring,” which powers the clock that powers the season. Peter Cottontail’s tech-head son (Tom Kenny), just as irresponsible as his old man was back in the day, naïvely facilitates the theft, then spends the rest of the story trying to fix his mistake. The same character Danny Kaye voiced in the original—a narrator with weird color-based magical abilities and Tom Bombadil levels of protagonist-rescuing deus ex machina magic—is back, but he’s morphed into a green-haired, spastic clown voiced by Christopher Lloyd. Where the Rankin-Bass original is trippy in its surreal and expansive dreaminess, this one’s trippy in that it’s filled with bright colors, lots of motion, and upbeat alterna-pop seemingly rescued from a ’90s remainder bin. It’s harmless kids’ entertainment, unless you count leaving kids with a taste for Gin Blossoms-esque rock as doing them harm. This ugly-looking, barely animated video feature may just be enough to make the heyday of Rankin-Bass seem like a golden age. It’s set in an idyllic community called Eggtown, where “rabbits and chickens live together in harmony.” The big event of the year is Egg Day, when the kids report to the local hatchery to gather and paint the fresh eggs, while a contingent of designated “rappers” perform a hip-hop number designed to enhance the hens’ production. When some bad animals from outside the gated community break into the hatchery and steal the eggs, it’s up to such local heroes as Good Gracious Grasshopper, Boring Benedict Bunny, and Horrible Harriet Hare to save the day. Harriet and Benedict are in love, though they’re too shy to admit it, and something or other keeps getting in their way. (In one scene, the two of them go on a picnic and are about to kiss, when a bird poops on Benedict’s nose.) In the end, they do finally get together, even though he’s drawn so out-of-shape and so much older than her that it’s like the woodland version of Salman Rushdie and Padma Lakshmi. The classic weepie Steel Magnolias isn’t about Easter, per se, but its timeline takes its structure by leaping from holiday to holiday, showing how life changes for the cast over the intervening years. Here, Easter doubles as a symbol for spring and the beginning of new life—the film opens on an Easter, with a small-town Southern wedding that leads to a birth that leads to a death. It bookends that opening scene with a closing scene, also on Easter, in which a character rushes off to the hospital, about to deliver an infant named after the character who died. Symbolism aside, the setting also provides plenty of chances for holiday chaos, with a car-trunk full of painted Easter eggs being accidentally smashed in the opening sequence, and an angry man in a stuffy Easter Bunny suit trying to get out of presiding over a thoroughly massive, town-wide egg hunt in the closing scene. Return with us to those thrilling days when Bob Hope was alive, more or less well, and still had enough fans to warrant a couple of TV specials a year. While Hope’s Christmas specials are fondly remembered, his other efforts have mostly faded into obscurity, like, for instance, his 1989 Easter Vacation In The Bahamas, which has fallen so far out of memory that it doesn’t even earn a mention in Wikipedia’s list of Hope’s TV appearances. Thanks to YouTube, however, viewers can enjoy a trip back to a bygone era when someone apparently convinced Hope’s producers of La Toya Jackson’s hipness, since she’s clearly positioned as the special’s only effort to appeal to “the kids,” what with the other guest stars including Barbara Mandrell, Tony Randall, and Andy Williams. Hope’s monologue feels almost as old as the Easter story itself, given the inclusion of jokes about the Ayatollah Khomeini and Ted Turner’s tendencies toward colorization, but there’s still something about his well-worn delivery that causes the proceedings to teeter toward timelessness. “I am the salt, the bitter laugh / I am the gas in a womb of light, the evening star / The ball of sight that leads, that sheds the tears of Christ.” Patti Smith’s haunting, dirge-like title song brings down the curtain on an album saturated in religious imagery, from the Bible verses alluded to in the liner notes to the boast “I have not sold my soul to God,” all of it no doubt heartfelt, and some of it borrowed from unlikely places—such as Peter Watkins’ 1967 anti-rock-star movie Privilege, source of the song “Privilege (Set Me Free).” It’s not just a personal statement on a spiritual level, either: Smith positions the record as her own resurrection, after the disappointing reaction to her previous album Radio Ethiopia, and a neck injury that kept her offstage for most of a year. And the album really did resurrect her career, thanks largely to the top 20 hit “Because The Night” and an assist from the humble song carpenter who chose to live among and speak for society’s outcasts, Bruce Springsteen. Nobody makes childhood nostalgia seem as horrific or absurd as Patton Oswalt. Witness his riff on the PAAS Easter egg dye kit, from Feelin’ Kinda Patton. Oswalt describes the routine childhood experience of preparing a painted Easter egg using the branded PAAS egg-painting tackle like it’s a scene out some student film about the putrefaction of the American family: The dyes make the tap water smell “like a vinegar fart,” and his childhood impatience in placing the prepared eggs in their prefab cardboard holders caused them to dissolve, effectively ruining Easter at the Oswalt household. The funniest thing here is Oswalt’s analysis of PAAS as a monopoly that holds control of the Easter egg dying racket like some seasonal cartel, and the plucky young upstarts like Shake-An-Egg that tried to “unseat the PAAS dynasty.” Even the joyous rebirth of the spring season can be co-opted by corporate interests looking to make a quick buck off colored paint tablets. There are few pop-culture bits that get to the inherent weirdness of Easter celebrations like Bill Hicks’ takedown of the holiday from Rant In E-Minor. Clocking in at just under a minute and a half, Hicks gets right to the heart of the absurdity of how we celebrate Easter, “commemorating the death and resurrection of Jesus by telling our children a giant bunny rabbit left chocolate eggs in the night.” He goes on to offer a similarly arbitrary alternate tradition: goldfish that leave Lincoln Logs in your sock drawer. Hey, at least that has a miraculous connotation, he points out. He wraps it all up by stating the obvious: No matter how thorough your study of the Bible is, you won’t find a single mention of bunnies or chocolate anywhere. The oddness of the Easter Bunny tradition speaks to another problem with creating Easter-themed pop culture that will resonate. While many cultures have a vaguely Santa Claus-like figure, the Easter Bunny is a tradition that hasn’t spread much beyond North America. In this essay from the collection Me Talk Pretty One Day, David Sedaris attempts to explain the Easter Bunny—or, rather, “the rabbit of Easter! He bring of the chocolate!”—to a bunch of fellow students in France. Turns out that in France, the bringer of gifts on Easter is… a giant bell that “flies in from Rome,” as if that makes any more sense than a rabbit that drops off eggs. Sedaris’ attempts to make himself understood in a language he doesn’t speak are hilarious, and the oddness of Easter traditions adds even more laughs. Sedaris told the story on This American Life, and it became one of the show’s funniest segments. Michael Learned’s work as Olivia Walton was one of the strongest dramatic performances on television in the 1970s, offering up a portrayal of a strong, tough woman who didn’t complain and simply gritted her teeth to get through whatever indignities the Depression could send her way. In the two-hour season finale for the series’ first (and best) season, Olivia learns that she has contracted polio after coming home from church on a cold February day. The local doctors don’t hold out much hope, but faithful son John-Boy asks at the University Of Virginia for a possible cure and is given a treatment the local doctors insist won’t work. Of course, it seems like it won’t at first, but early on Easter Sunday, Olivia is able to rise from her bed when she thinks she hears one of her children calling for her, and the family celebrates her miraculous healing at the church’s sunrise service. It’s an episode that allows for interpretations both religious—offering up plenty of “God saved Olivia!” bits for those who want to see them—and secular—Olivia, after all, is helped by medicine and the closeness of her family. The second best-known novel by Revolutionary Road author Richard Yates, The Easter Parade isn’t exactly brimming with Easter-y sentiments. It’s the story of two sisters who grow older and older, their lives drawing them inexorably apart and further and further from the happiness they once felt, fleetingly, at the titular event. The book covers 40 years of the 20th century, with sister Emily never able to find love, wherever she tries, and sister Sarah enduring an abusive husband and an unsatisfying life as a mother. As with all Yates novels, the characters long for a youth they can no longer return to and a happiness they will never attain, and that Easter parade just seems like more and more like a distant memory for the sisters, and possibly the country they inhabit. One of the earliest viral videos, “The Easter Bunny Hates You” is nothing more than a man in an Easter Bunny costume running around and shoving people, but man, is it funny. If this is a holiday without a consistent pop-culture throughline, can we at least make the Easter Bunny as ultra-violent as possible?